Check out our Java Classics, a complete coffee program. 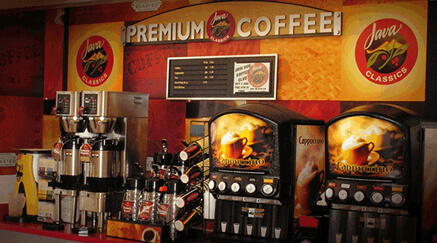 Fresh brewed Java Classics is a flexible coffee program designed to sell, to reduce shrink, and increase profits. We are confident that you will be pleased with the results from Java Classics. Just let us know your interest and we will be happy to suggest the best Java Classics coffee solution. Check out all our favorite flavors listed below. To find out about even more Java Classics beverages, see your sales rep, or give us a call today. These Java Classics coffee flavors are very popular. There are even more available flavors that we stock for your convenience. Introduce your customers to the ultimate Java Classic cappuccino flavors. Sales for each of these products are solid and consistent. Ask us about additional cappuccino flavors that are also available.